An update on InvestingSidekick.com and the recent trades in my portfolio. 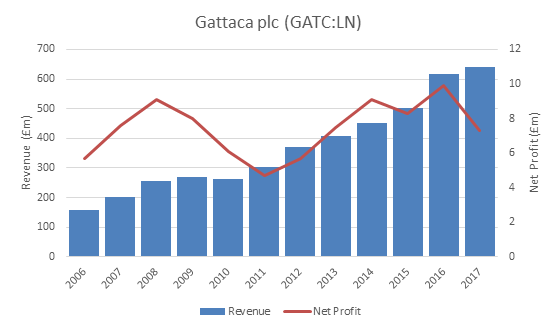 I bought shares in Gattaca (GTAC:LN) over a year ago but never did a proper write-up on the company. The shares have been one of the worst performers in my portfolio, and after the company issued a profit warning earlier this month, the shares were predictably hammered. I was down 43% on the position so it was time to do a proper analysis of the company and see if my thesis has changed. I thought I’d share this interesting little hedge that I’d considered a few weeks ago but never made (unfortunately). 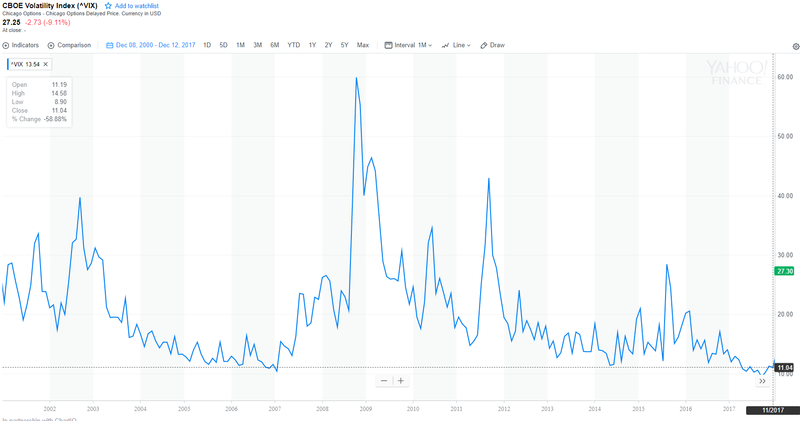 A trader friend of mine mentioned in December that I take a look at the CBOE Volatility Index (VIX) if I wanted to hedge my portfolio. He was right. Here’s how it played out. 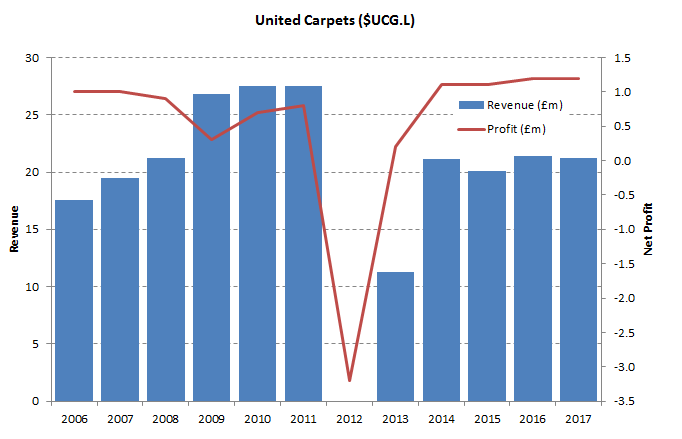 I first wrote about United Carpets just over a year ago, when I noted that the company was trading at an enterprise value of £6.8m despite making £1.2m in net profits. Since then the share price has fallen even further and the EV is now £5.3m. I took another look at the company and saw that the investment thesis has not changed. It’s last half year report showed increased like for like sales, stable profits and an outlook that was positive up to December 2017 but cautious of the general environment. I decided to take a longer look at the company’s history before deciding whether to add to the position. I started the position small at around 2% due to being uncertain about how 2017 would play out, so with an extra year of data, it was time to decide whether to make it a full size position. 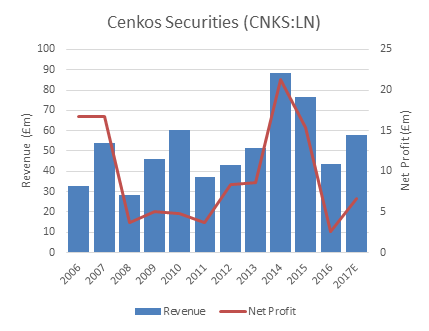 Cenkos Securities is a company I came across a while ago and have just added to my portfolio. I was attracted to its strong returns on capital of 20-40% and cash generative business (free cash flow has been roughly equal to net profit over the last 6 years). It also has a consistent record of returning all the cash it generates to shareholders (yes, all of it) via dividends and share buybacks. Since it listed in 2006, it has returned over £105m to shareholders (well over the current market cap of £64m). So is it going out of business, or struggling? No. It has net cash of £17m and another £20m in short term investments. The company has never made a loss and doesn’t look like it ever will due to the nature of the business. It is only at a P/E of around 10 (from a base of modest earnings) and with a forecast dividend yield of almost 10% this year. This is an update of my portfolio. I’ve sold a couple of positions in my portfolio in the last week, PTL and SFT. Staffline (STAF:LN) is the market leader in the recruitment and outsourcing of human resource services to industry and services in the welfare to work arena and skills training i.e. blue collar workers. It has just delivered a trading update which confirms it will meet full year expectations for 2017 (net profit £30.2m) which makes its current market cap of £271m attractive (P/E of 9). But it gets even better. Staffline’s net profit does not do justice to its cash generation power, as it has a large amortisation charge which does not reflect true business costs. Its true free cash flow is closer to £40-45m! Another 6 months have flown by and it’s time to report on my portfolio’s performance again. At the end of the first half of 2017 I was in the midst of investing in a large pot of Japanese small stocks and haven’t made many changes to the portfolio since. I had 26% cash but this quickly reduced to 13%, so I was almost fully invested for this half. The portfolio returned 10.4% in H2 2017, outperforming the FTSE All share tracker which returned 4.4%, and the S&P tracker which returned 9.8%. That brings my cumulative performance since inception in 2013 to 313%, or 26% annualised. I keep thinking these years of good performance need to end at some point as the stock market cools off but the end isn’t in sight yet. I generally think my portfolio is somewhat uncorrelated to the wider market, given that most of my money is concentrated in relatively few UK small caps, and 25% is now in a basket of Japanese small caps. This is an update on one of my portfolio positions, 800 Super Holdings, which I have held since late 2015. I was perusing their latest set of results and checking profitability. On the surface everything looked fine, revenue was slightly down but profit margins expanded to give a full year profit of S$17m compared to S$16.7m last year. Compared to the current market cap of $219m, this seems to put them on quite a fair valuation given the growth and I was happy to continue holding. However, a closer look at the cash flow statement showed something worrying.